Doyle Roddy, Seaman 1/c, born May 29, 1920, Atoka, OK. 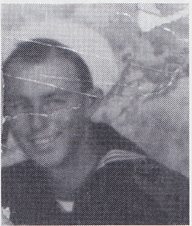 He joined the USN in December 1940 and was stationed at Bremerton, WA; San Diego, CA; and was aboard the USS West Virginia at Pearl Harbor. Discharged in January 1946. His awards include the Purple Heart. Was owner of his own business and is now enjoying his retirement. He lives in Redlands, CA, and has four children and four grandchildren.